The "fat hill" produced silver, lead and zinc for a century. At its peak over 1,000 people lived here working in mines as the San Felipe and Union. At the time the smelters were the best there were. Silver was roasted and formed into bullion, sent down the Yellow Grade road by mule team, then shipped across Owen's Lake by steamboat. From the lakeside port of Cartago the bullion was loaded onto Remi Nadeau's freighters and hauled into Los Angeles. 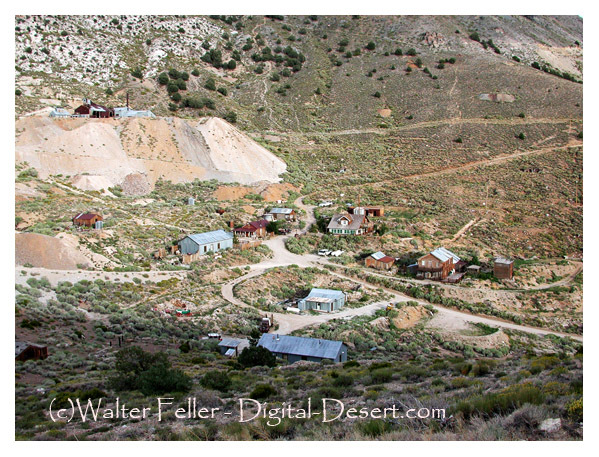 The rise and fall of Cerro Gordo in the Lone Pine Mining District.